Rent this 3-bedroom historic lighhouse keepers cottage on the shores of Puget Sound by the week for $700 during the summer and $600 in the winter. 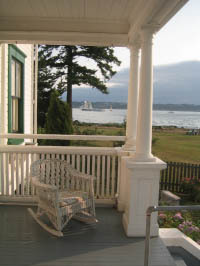 Relax and watch sailboats, walk on the beach, fish from the shore, enjoy sunsets and reading in antique rocking chairs from the porch. 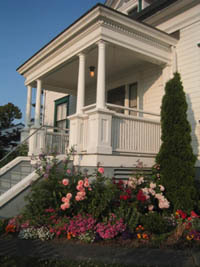 Because this 1903 cottage, restored and furnished with period furniture, is on the National Historic Register, it is a living museum so by staying here you become part of the history of this Washington Landmark. The cottage and other facilities on the park-like setting grounds are part of the Browns Point Lighthouse property so you and your family, up to six people, will become honorary lightkeepers. As such your "tour of duty" includes requirements to raise and lower the flag, log in weather and shipping traffic, water the surrounding cottage gardens and have Cottage Museum and History Center open for visitors on Thursdays, Fridays and Saturdays from 1-4.